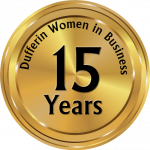 2017 marked the 15th anniversary for Dufferin Women in Business, (DWIB), which has established itself as the premier local women’s group geared to help women network their business, connect with other like-minded individuals and grow in their professional lives. DWIB is a committee of the Dufferin Board of Trade (formerly, Greater Area Dufferin Chamber of Commerce) and offers opportunities on a monthly basis for women to “Build, Connect & Grow”. We understand the importance of networking and more importantly “connecting”. As women, it’s in our DNA to nurture relationships, understand the pressures and be supportive to each other. We have all heard the saying that people do business with people they know, like and trust, (and more importantly who they would refer), but remember – connecting is not about you, but who knows you! The DWIB committee is a group of amazing volunteers who coordinate all aspects of the events through monthly meetings. To ensure women have the opportunity to attend, events are varied between luncheons and after 5’s. You don’t have to be a member of Dufferin Board of Trade to attend, however, we encourage you to understand the benefits the DBOT has to offer. This year we held various events focusing on networking with speakers talking on business growth, stress, accounting, tips on networking … We are excited about our full calendar of events for 2018/19. We encourage you to visit our events page at https://dwib.ca/events/ for a complete listing of up-coming events and details on how to register.